From the annual Flores de Mayo to little celebrations in your local community, this month brings on a flurry of pabitin, lechon and of course, pancit. Learn how to make this fiesta staple. 1. 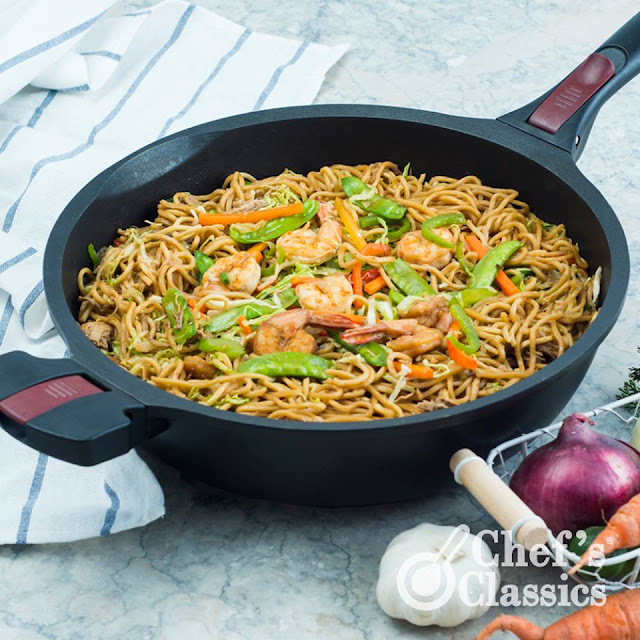 In a Chef’s Classics Caper Wok, pour two cups water and add chicken. Bring it to a boil and cook until tender. Set aside the liquid as chicken broth. 2. Shred the chicken and set aside. 3. Over medium heat, sauté the garlic and onions. 4. Cook chicken liver and shrimp for two minutes. 5. Add the celery, bell pepper, snow peas, carrots and cabbage. Let it cook for two minutes and transfer to a plate. Set aside. 6. In the same wok, add the soy sauce and chicken broth. Bring it to a boil. 7. Add the dried noodles. Gently toss until the noodles absorb the liquid. 8. Mix in the vegetables and season with salt and pepper. Remove from heat. 9. Garnish with green onions and calamansi. Serve to your guests!